The LDS (Mormon) Church will hold is fall conference in Salt Lake City this weekend, and that always brings a crowd to the downtown area. Conference meetings will be held in the Conference Center, adjacent to Temple Square. Meetings last 2 hours and begin at 10 am, 2 pm and 6 pm on Saturday, and at 10 am and 2 pm on Sunday. Traffic will be heavy before and after meetings. In addition, the University of Utah hosts Washington in a big football game Saturday. Kickoff will be at 5 pm in Rice-Eccles Stadium, on the U Campus on the eastern edge of town. Construction on I-15 and in many other areas is an ongoing annoyance and will definitely slow traffic this weekend. In addition, it will be impossible to find parking spots in downtown Salt Lake and around the U Campus. Trax and Utah Transit Authority buses provide a convenient and reliable way to get downtown and up to the University. Extra buses are scheduled to run throughout the weekend to help alleviate some of the traffic congestion. See the UTA website for information on schedules and routes. On a side note, The Republic newspaper in Columbus, Indiana, has this short article about the traffic congestion expected in Salt Lake this weekend. I'm not sure why, but it come up when I did an Internet search for Utah-related news items. With leaves starting to turn colors, many people are getting out and driving paved and dirt roads into Utah's canyons and forests. Many hunting seasons take place during the fall, and that also motivates people to get into the backcountry. The Uinta-Wasatch-Cache National Forest has issued a reminder that some forest roads are still closed because of damage that occurred during our extra-ordinarily heavy spring flooding. The Mineral Basin Road is temporarily closed while crews replace a culvert that was washed out by runoff. That road is scheduled to be closed through Sunday, October 2, 2011. Farmington Canyon and Providence Canyon roads probably won't be fixed until next summer. You may want to contact Forest Service or other land management offices to learn about current road conditions before heading out into the hills. If you would like to participate in the annual Bison Roundup on Antelope Island, you need to make your plans now. The roundup will take place Friday, October 28 and Saturday, October 29, 2011. New this year, Antelope Island State Park will host a Roundup Reunion Thursday, October 27. Join us for the 25th Annual Bison Roundup, Friday, October 28 and Saturday, October 29, 2011. Volunteer wranglers will saddle-up and move the park's herd of 600 free-roaming bison from the southern tip of the Island to the bison corrals on the northern end of the island. The best viewing opportunities are from the East Shore Road. Watch as horsemen and women move the herd across the island. New this year, join us for a Roundup Reunion Thursday, October 27. On November 4 and 5, watch as veterinarians and state park wildlife biologists weigh, vaccinate and conduct various health tests on each bison to determine the herd's health. In order to keep the herd at a healthy number that the island can sustain, approximately 200 bison will be sold at a public auction in mid-November. Money generated by the sale of bison goes into the wildlife management program for operating costs, habitat improvement projects, research and data collection, and infrastructure development of the bison corrals. Join us for the Great Bison Roundup Reunion Thursday, October 27, 2011 at historic Fielding Garr Ranch at Antelope Island State Park. Register now! We're planning a great day of range riding, a Dutch oven dinner, live and silent auctions, music and memories. Dutch Oven Dinner by Moon Dogs Cafe - Delicious Western fare and a special children's menu. Register Online Now! To submit photos from previous Bison Roundups, please contact Robin Watson-Christianson at robinwatson@utah.gov . All donations are tax deductible and proceeds go toward landscaping and rehabilitation of natural areas at Fielding Garr Ranch. Artist Larry Nielson created this beautiful work of art, which you may bid on at the silent auction. The Quarry at Dinosaur National Monument will reopen on Oct 4, after being closed while the building that shelters it was rebuilt. The new Visitor Center is now open. The new Quarry Visitor Center IS OPEN! Its sister building, the Quarry Exhibit Hall will open October 4th. The Exhibit Hall houses 1,500 dinosaur bones still embedded in a cliff. If you visited the monument in the past and remember driving up a hill to a building that was both the fossil quarry AND visitor center in one building, that is no longer the case. The buildings are now a half-mile apart. The visitor center has been completed but the quarry isn't quite done yet. Rangers recommend that you postpone your visit until at least October 4th if at all possible when the quarry will open. If that is not an option, a few dinosaur fossils can be seen along the Fossil Discovery Trail. Fall colors are starting to pop in Utah’s canyons – the next couple weeks will provide great viewing opportunities in northern Utah. For many spots in southern Utah, colors will get started in earnest in a couple weeks. The title for this blog post comes from this Salt Lake Tribune article, which announces that the 62nd annual Warren Miller ski movie will make its world premier Oct. 14-15 at Abravanel Hall in Salt Lake City. "After that, the 240-city fall tour will proceed to Orem (Oct. 18-20), Park City (Oct. 21-22) and Ogden (Oct. 25-27). " Below are more excerpts from the article. She is featured along with Salt Lake Valley residents Rachael Burks, Carlo Travarelli, Leo Ahrens, Sam Cohen, Ben Wheeler and former big-mountain skiing world champion Brant Moles. See the Warren Miller website for more information. A Miller news release provided these tidbits. This year, Warren Miller Entertainment offers your first stop for preseason powder stoke, with the introduction of its 62nd annual winter sports film, Warren Miller’s . . . Like There’s No Tomorrow. Narrated by Olympic Gold Medalist Jonny Moseley and shot on location on five continents, . . . Like There’s No Tomorrow celebrates the moments that make up a perfect winter. Tour the world’s most inspiring snowy landscapes, from the rugged peaks of New Hampshire’s Mount Washington to the legendary powder of Squaw Valley, California; from the striking Himalayas in Gulmarg, India to the southern hemisphere’s highest peak in Portillo, Chile. Alaska. Utah. Colorado. New Zealand. Norway. It’s all here, just waiting for you to fill in the blank. Watch world-class athletes – including Chris Davenport, Julia Mancuso, Daron Rahlves, Colby West and Seth Wescott – drop lines most of us only see in our dreams and learn, frame-by-frame, how to live . . . Like There’s No Tomorrow. Check warrenmiller.com for a complete showcase of this year’s film locations and extended athlete bios. There will be no entrance fee at Utah national parks on Saturday, and other national parks throughout the country, in celebration on National Public Lands Day. Entrance fees are waived on several weekends during the year to encourage the public to visit our parks. The next free day at the national parks is Veterans Day weekend, Nov. 11-13. There will be many special activities at parks and other public lands this weekend. Zion National Park provided the information below. On Saturday, September 24, Zion National Park will join sites throughout the United States to celebrate National Public Lands Day. Efforts associated with this annual event contribute to the beauty and restoration of parks and other open spaces where the public hike, bike, climb, and explore. In celebration of this event, Zion National Park will offer free entrance to the park. Park visitors are reminded that the fee waiver is only valid on Saturday, September 24. Visitors who plan on being in the park beyond this date must pay the regular entrance fee for the remainder of their stay. The fee waiver applies to entrance fees only and does not affect fees for camping, tunnel traffic control, or backcountry permits. The public is also invited to join in a volunteer service project at the Zion Canyon Visitor Center complex. This project will include spreading mulch and pruning shrubbery throughout the visitor center area. Volunteers are asked to gather at the Zion Canyon Visitor Center at 9:00 a.m. on Saturday, September 24. The project will last until 1:00 p.m. Participants should wear clothing that is appropriate for working outside, including a hat and sturdy shoes or boots. No registration is required. Please contact Zion National Park's volunteer coordinator at 435-772-0184 for more information. National Public Lands Day is the nation's largest hands-on volunteer effort to improve and enhance public lands. Originally established in 1994, it has become an annual event that allows volunteers to be directly involved in the stewardship of public lands. More than 180,000 volunteers are expected to take part in National Public Lands Day at more than 2,000 sites across the country. For more information, please visit www.publiclandsday.org. Salt Lake City is adding bike lanes on many important streams, and is becoming much more bike friendly. Some new lanes are open now and others will open during the next few weeks. The Salt Lake City website has good info about biking, along with maps showing existing routes. New routes will be shown on those maps as they are completed. The Salt Lake Tribune has this new article describing the new bike lanes and the city’s plan for expanding options for bikers. Below are excerpts. By winter’s start, about 50 miles of new and improved lanes will have been added to the capital this year, along with bike parking corrals and more bike symbols to help both motorists and cyclists stay safe. Salt Lake City may not be quite as bike-friendly as a city like Portland, Ore. — yet — but the mayor’s office is working on it. Officials believe the city’s number of bike commuters may be on the rise and are in the midst of an bike count through volunteer observation, with results expected in the coming weeks. Many of Saturday’s participants said they used their bikes to ride to work, to go to dinner and meet friends. And at a time when money is short, biking saves money on gas. Shared lane markings have been popping up around the city to indicate that drivers and cyclists share the lane even though there is no separate bike lane. The symbols are expected to appear soon on 800 East, 500 East and South Temple. The public is welcome to give the mayor’s office feedback on these and other bike designs at bikeslc@slcgov.com. Wanderlust on Yahoo.com has this interesting list of what it calls the 5 top non-ocean beach destinations, and Lake Powell is mentioned first in the article. Lake Powell, Utah: Beautiful Lake Powell is located among the red-rock canyons of Utah. For the athletic types, there's everything from kayaking to hiking; for the not-so-athletic types, there are plenty of houseboats available for lazing about. Fun fact: The lake has more shoreline than the entire West Coast. Interestingly, the quote above puts the lake in Utah, and the paragraph even has a link to our website (www.utah.com), but the video has a map putting the lake in Arizona. In fact, most of Lake Powell is located in Utah. A small portion, including the largest marina (Wahweap) is located in Arizona. Fall is perhaps the best time of year to visit Lake Powell. Summer's heat is abating; air and water temperatures are perfect. This is a great time to boat, ski, fish and hike. A small rockslide temporarily closed a main road in Zion National Park today, but the rocks have now been cleared and the road has reopen. The slide occurred in Zion Canyon near Court of the Patriarchs. More rain could fall tonight and tomorrow morning, but we should see clearing tomorrow afternoon. Earlier this month, some trails in the Kolob Canyon section of the park were closed because of a wildfire, but they have all now reopened. Fall is a great time to visit Zion Park. The summer “monsoon” season is now winding down, as daytime temperatures start to cool. The summer wildfire season is also winding down. Days will continue to be warm and nights will now be pleasantly cool. It is still warm enough to enjoy all kinds of activities in the park, without the oppressive heat of August. Much of the Zion Park backcountry is located at a high elevation and leaves there will start to turn colors in a couple weeks. It will still be a month or so before leaves turn in Zion Canyon, which is located at a lower elevation. There will be a big football game in Provo Saturday evening, when Brigham Young University hosts the University of Utah. The teams have been intense rivals over the years and the game is always exciting. Kickoff will be at 7:15 pm. Traffic will be very heavy along I-15 and University Parkway before and after the game. I-15 has considerable construction between Salt Lake and Provo, and so there is potential for major slowdowns. The area around LaVell Edward Stadium will be packed with people. In past years, BYU had Utah have played near the end of the season. The two teams have usually been in the hunt for conference championships and the game has often been pivotal, heightening emotions. Now, Utah has moved into the Pac-12 and BUY is independent, so the game will have no impact on conference standings. Still, the bragging rights and status at stake will make the game interesting. In fact, the BYU/Utah rivalry has been one of the most intense in the country. The Washington Post has this good preview of the game. Below are excerpts. Not much figures to change this year in the BYU-Utah rivalry, even if Saturday night’s showdown will mark the first time in 113 years the teams will play as non-conference opponents. “It’s still as big as ever,” Utah quarterback Jordan Wynn said of the rivalry, which has served as the regular-season finale in 28 of the last 32 years. Both teams are 1-1 and coming off tough road losses, with new coordinators trying to get their respective offenses moving. The Utes had a chance to tie Saturday’s inaugural Pac-12 game against USC only to see a last-second field goal attempt blocked and returned for a touchdown. BYU blew a 13-3 halftime lead and fell 17-16 to Texas. ... More uncertain is whether the rivalry will continue, what with all the conference re-alignment talk. Sunset magazine has this interesting article about scuba diving at "Bonneville Sea Base," a complex of developed hot springs near the south edge of the Great Salt Lake, just west of Salt Lake City. The article notes that scuba is a popular activity in Utah: "It ranks as one of the top 15 states with the highest percentage of divers per capita in the nation." The Crater at Homestead Resort also offers a great hot springs scuba experience. Below are excerpts from the article. What Utah does not have ― and you may have noticed this if you've ever visited here ― is an ocean. An ocean of any kind. Which is why Nelson and her husband and dhttp://www.blogger.com/img/blank.gifive-shop partner George Sanders had to create a substitute. "A lot of the hot springs had problems," Nelson recalls. "Too hot, too something." Finally, in the Great Salt Lake Desert near the town of Grantsville, they found a series of warm saltwater springs. These, they decided, would become Bonneville Seabase, named for prehistoric Lake Bonneville that once occupied this terrain. Seabase has four main dive areas: White Rocks Bay, Habitat Bay, Bubbling Sands, and the Abyss. White Rocks Bay is roofed so divers can use it during winter months when the air temperature hovers at zero. Habitat Bay teems with pompano and puffers and angelfish, many of which are rescued fish ― some, for example, retirees from the flashy aquariums at Las Vegas casinos. There are also two nurse sharks. Then it's my turn. Like skydiving, scuba was something I had always wanted to do that scared me. Now I have a chance for my first lesson. Nelson and her son, Lorin, suit me up, and I dive with him into Habitat Bay, down, down. And, after one moment of panic, I am diving. I breathe through the regulator. I glide forward. I feed romaine lettuce to the angelfish. Deborah Wall has penned this interesting article about exploring Bryce Canyon National Park. The article was published in the Las Vegas Review Journal. Fall is a grand time to visit Bryce. In fact, it may well be the most scenic season to visit, with leaves on some trees and brush changing colors, contrasted by the evergreen pine trees and multicolored rocks. Along the eastern rim of Utah's Paunsaugunt Plateau lies Bryce Canyon National Park, a visual feast for the eyes. Standing along the park's rim, visitors are treated to a multi colored landscape of natural spires, pinnacles and pillars called hoodoos. Depending on how much time you have in Bryce and your physical abilities, there are plenty of hiking opportunities. For an easy hike, the Rim Trail is tops. Although the Rim Trail extends about 11 miles, choosing to do one or more of its short segments is best. The half-mile section that runs between Sunset and Sunrise points is not only fairly level and paved but also has some of the best views into the escarpment. For those seeking to get down into the hoodoos, the 1.3-mile Navajo Loop Trail is a fine one and is moderately strenuous. It was closed for a while due to rockfalls and mud slides but has reopened. The hike begins at Sunset Point and travels down into a nice slot canyon below the rim. A more strenuous hike, and therefore one that offers quite a bit of solitude, is the Fairyland Loop Trail. It travels about eight miles and features the stunning formations called China Wall and Tower Bridge. Seeing the park's hoodoos at night under the glow of a full moon is a sight you won't soon forget. On Sept. 11-13 or Oct. 11-13, you can take part in the guided Full Moon Hike. It takes 1½ to 2½ hours. These fill up fast. If you are interested, be sure to register at the visitor center first thing in the morning on the day of the hike. The second annual Thanksgiving Point Harvest Festival and Art Market will take place on Sept 23 and 24. The festival is held at Water Tower Plaza at Thanksgiving Point, located just west of I-15 in Lehi (about half-way between Salt Lake City and Provo). The festival offers the chance to buy farm-fresh product and learn about many gardening topics. In addition, it offers live music and many kinds of activities. A “quick draw” competition will allow artists to show off skills by creating a painting in 90 minutes or less. There will also be a “great pumpkin” weigh-off. See the Thanksgiving Point website for more information. The festival provided the information below. Several other fun festivals are offered in Utah County. See this website for details. Kick off the official start of autumn at Thanksgiving Point. Join with us in celebrating at the 2nd Annual Harvest Festival where guests are invited to peruse locally-harvested fruits and vegetables and shop for locally-made products. Friday evening a Quick Draw (timed painting) competition will delight the crowds while artists race to make a masterpiece in 90 minutes. On Saturday, community favorite Utah’s Giant Pumpkin Growers will bring their year’s biggest and best pumpkins to be weighed and judged in the U.G.P.G (Utah Giant Pumpkin Growers) 8th Annual Giant Pumpkin Weigh-off. Last year’s winner set a new state record- spectators will watch in suspense to see it happen again. Live music on Friday and Saturday, as well as themed crafts on Saturday are sure to create a memorable atmosphere. -Giant pumpkin/gourd weigh-off by the Utah Giant Pumpkin Growers. -Quick Draw Competition, judging, and awarding. -Tours of the new People’s Garden at Farm Country. -Vendors: Food, Craft, Art, etc. A very interesting series of events will take place in Moab over the next few weeks, when people parachute from hot air balloons. Along the way, the see spectacular area scenery from a unique perspective. There are still spots available for people who want to jump, and also for passengers who stay in the balloon balloons. Six sunrise balloon flights are being offered, with a total of 60 tickets available. This website has details. Below are excerpts. A Balloon Jump in Moab is a world class experience and Skydive Moab has worked to make that option possible. All tickets will be sold in Advance : Simply Purchase Flight Voucher and select Preferred Flight Date then check back to confirm spot on manifest which may be weather updated the night before flight. Spectator Passengers experience the thrill of watching their friends and family “base jump” from the basket with only 20 seconds of free fall to stabilize and pull their chutes….followed by an intimate tour of the Canyonlands and Arches National Parks as the balloon returns to earth in search of an old mining road or other suitable landing spot in the delicate desert landscape. This can take up to another 45 min of breathtaking flight across the ancient sea beds frozen in time. The annual Strawberry Valley Wildlife Festival will be held on Sept. 24, 2011, at the Visitor Center adjacent to Strawberry Reservoir. It offers the chance to see unusual wildlife, including bright red kokanee salmon. Kokanee are a land-locked salmon that only live in a few waters in Utah. They turn red just before they spawn. The swim up streams where they are easily visible, spawn and then die. The festival is timed so participants can see red fish in the Strawberry River, above the reservoir. 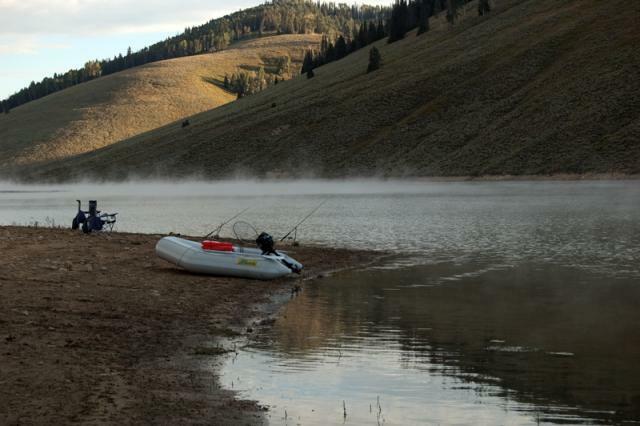 Fishing picks up at Strawberry Reservoir during the fall, and fishing information will flow freely at the festival. It is great fun to attend the festival and then head over to the reservoir to fish. Utah's Division of Wildlife Resources provided the following information about the festival. They also provided the photo. Wasatch County — Bright red kokanee salmon have started to swim up some of the tributaries to Strawberry Reservoir. The salmon make this journey as part of their annual spawning run. You can see hundreds of these salmon—and possibly other wildlife, too—at the annual Strawberry Valley Wildlife Festival. The festival will be held Sept. 24 at the U.S. Forest Service visitor center at Strawberry Reservoir. The visitor center is along U.S. Highway 40, about 20 miles southeast of Heber City. The festival is free. It runs from 9 a.m. to 3 p.m. The Friends of Strawberry Valley host the festival every September amid the valley's beauty and changing fall colors. When you attend the event on Sept. 24, you'll see some salmon in the Strawberry River next to the visitor center. But if you walk to the fish trap and egg-taking facility behind the visitor center, you'll see hundreds of the bright red fish. Division of Wildlife Resources biologists will be available at the facility to show you the salmon and talk with you about the peculiar life cycle of the fish. Festival activities will include a chance to look at animal tracks and hook and land a 'virtual' fish on a fishing simulator. Several other booths and displays will also be available. The U.S. Forest Service will invite Smokey Bear to make appearances throughout the day. For more information about the festival, call the Uinta National Forest at 435-654-0470 or Scott Root with the DWR at 801-491-5656. Utah's Division of Wildlife Resources provided this information about the festival. They also provided the photo. The Utah Office of Tourism has released its 2012 Scenic Calendar - and this marks the 40th anniversary of the popular publication. The calendar can now be ordered via the Office of Tourism website, and will soon be available in the utah.com store. Below is information the office provided about the calendar. The Utah Office of Tourism has released its 2012 Utah ‘Life Elevated®’ Official Scenic Calendar. Now in its 40th year, the annual award-winning publication highlights many of Utah’s iconic destinations, outdoor activities, and events through its stunning photography and award-winning graphic design. A photo of iconic Delicate Arch in Arches National Park, taken by accomplished Utah photographer Scott T. Smith, was selected as the cover image. Many other Utah destinations are featured throughout the calendar including all five national parks, many of Utah’s state parks, national monuments, ski resorts, national forests, Temple Square, and various activities available to visitors. The Utah Scenic Calendar is recognized regularly for design and photography. The 2011 edition was honored with 13 awards in the National and World Calendar Awards competition, including a Gold Award for Best Graphic Design. Bulk orders of 50+ calendars are available at the reduced price of $8 each, reflected at checkout. If you have questions, please call the Utah Office of Tourism at 801-538-1900. Utah stages an old fashion style state fair, with animal exhibits, home crafts, a rodeo and plenty of entertainment. This year the fair will take place Sept 8-18, at the State Fairpark, North Temple and 1000 West, in downtown Salt Lake City. The Salt Lake Tribune has this article about the fair. Below are excerpts. The fair is a place where someone might dare you to eat chocolate-covered crickets and scorpions, a maggot melt sandwich, hamburgers where doughnuts serve as buns or deep-fried butter, all items that will be available this year. It might be a chance to see a performer such as Weird Al Yankovic put on a 2 1/2-hour concert with 11 costume changes. It could be a place to watch an outdoor rodeo, a demolition derby, a hypnotist, a seal show or a cow sculpted from butter. This is where you go to see if your favorite aunt win first prize for a giant pumpkin, to view artwork and photos produced from around the state, to let your grandchildren ride a pony, view the wildlife displays at the Fish and Game Building, eat cotton candy and to experience the smells produced by farm animals such as goats, sheep, pigs and cows. It’s where a boy tries to win a stuffed animal for his date and where friends dare each other to go on the biggest thrill ride in the carnival. It might be a place to people watch or to wander through aisles of commercial exhibits where you can purchase a set of knives, some pots and pans, the world’s best peeler, a salsa maker, potions with amazing healing powers, a funeral or toys found nowhere else. That’s just one slice of Americana involved in the Utah State Fair, an event that has seen a little bit of everything in its 156 years. The big Labor Day holiday is now over – which means summer is essentially gone. The leaves will soon start to turn colors in the high country in northern Utah. Most areas in the state will still have summer-like temperatures, at least for another week or two, but fall is just around the corner. There is change in the air – you can feel it if you are in the right places. I sure felt it last night as I camped near Electric Lake along Skyline Drive in Central Utah. Temperatures were warm during the day but turned crisp as soon as the sun went down. I was snug in my sleeping bag and was very surprised to wale up to frost on my truck windshield. Electric Lake is located at a high elevation and temps there are obviously starting to cool down. We didn’t see any colored leaves on our trip, but the Skyline Drive area will be ablaze within a couple weeks. We enjoyed a great trip but fishing was slow this time. The lake was not crowded. There was a concentration of RVs parked near the top of the lake but apparently most of the RVers were hunters, not fishermen. Fishing usually improves as temperatures start to cool. During fall, when most people stow their tackle and settle into the recliner to watch football, the fish start to feed heavily to fatten up before the lean days of winter. I expect our slow fishing day at Electric Lake was just a fluke – action will almost certainly be good this fall. Nearby Scofield Reservoir should also offer good fishing, as should Strawberry and other popular waters. In southern Utah, summer will linger into October. Temperatures are still hot in St George, Moab and the nearby national parks. Temps at night will soon start to cool but days will remain warm. Fall is my favorite time to visit Lake Powell. Hot summer temperatures will soon be gone, but the air will still be warm enough to enjoy time on the water. The water is slower to cool – it will remain warm into October. September and early October are great times to boat, ski and fish at Powell. Our ski enthusiasts are hoping for a wet, cold fall to usher in early skiing. That’s fine, if it stays up north. I’m voting for a long, warm, dry fall in the southern Utah park country. The annual Salt Lake Greek Festival will be held at the Holy Trinity Greek Orthodox Church, 279 South 300 West, in downtown Salt Lake City. It will run Sept 8-11. It is a celebration of all all things Greek, and many activities focus around food, music and dance. The festival also includes a 5K run and 1K run/walk. See the festival website for a schedule and other details. This year, food from the festival will be available for delivery. KSL TV has this report describing the festival and the food delivery option. Below are excerpts. The authentic food and pastries always draw big crowds, but long lines have made it harder for businesspeople to attend during lunch breaks. That is, until this year. The festival will be including some downtown deliveries. "Friday during the lunch hour we are offering a delivery service," she said. "You can call in or fax in and order or email it. It's all online." While you won't get the exact same variety as what's being served at the tents, you will get a choice of a gyro plate, souvlaki plate or a combo plate. The souvlaki and gyro plates are $10 and the combo plate is $13. The Solider Hollow Classic Sheep Dog Championship & Festival is held annually over Labor Day weekend (Friday-Monday). In 2010, some 25,100 people participated in the festival. This year's event will be bigger and better than ever. Soldier Hollow is located near Heber City. It was an important venue during the 2002 Winter Olympics, and is now part of Wasatch Mountain State Park. It offers activities year-round. See the festival website for details and a complete schedule. The Deseret News has this article about the Classic. Below are excerpts. Sheepdog competitions are international events, designed initially so handlers can later buy pups from champion dogs. Most of the invited dog-handler teams at the Soldier Hollow event are national champions or have significant standing in their own country. Beverly Lambert, from Handover, Conn., has been a contestant since the event's second year and has won twice. Her motive for coming: "To win." But it's more than that. Lambert no longer makes her livelihood with sheep. "It's more of an expensive hobby," she said. "People react funny when I say it's expensive, but you need more than just a dog. You need a farm and flock of sheep." Events in addition to daily sheepdog competitions include best-dressed dog and ugly mutt championships, law enforcement K-9 demonstrations and a dock diving dogs competition. All-day events are scheduled Friday through Sunday with a medals ceremony Monday.